A crash course in transcription through the lens of Bach’s first keyboard Partita. Breaking down the transcription process into manageable steps and finding the best solutions to seemingly impossible problems. 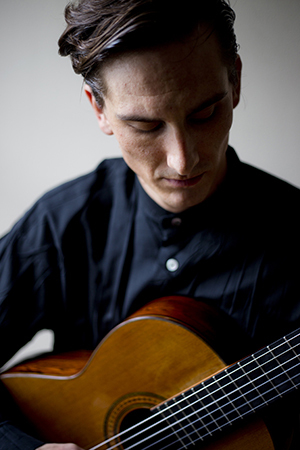 Max Zuckerman is a multifaceted guitarist living and working in Brooklyn, New York. He received his Master of Music Degree from the Yale School of Music where he studied with Benjamin Verdery. Max is also a graduate of the Peabody Institute of The Johns Hopkins University in Baltimore where he earned both a Bachelors of Music and a Graduate Performance Degree in the studio of Manuel Barrueco. Prior to his enrollment at the Peabody Institute, Max studied guitar for twelve years with Scott Cmiel, in San Francisco, where he also completed the Certificate Program of the Preparatory Division of the San Francisco Conservatory of Music.